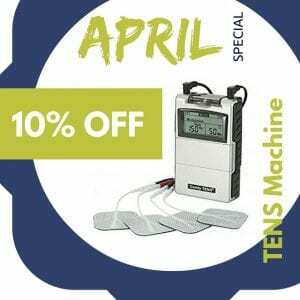 This month our home TENS Machines are on special : 10% off !! For some people, a transcutaneous electrical nerve stimulation (TENS) machine is used as an alternative to painkilling medication. A TENS machine is a small portable, battery-operated device which is worn on the body. The box is attached by wires to sticky pads stuck to the skin. Small electrical pulses are transmitted to the body, like little electric shocks. This can help to ease pain in some people with certain types of pain. Although there is not much robust proof that TENS machines work, many people do find them very helpful. The advantage is that TENS is well tolerated and largely without side-effects. How effective are TENS machines? Research trials looking at the effectiveness of TENS machines have so far been inconclusive. Further large studies are needed to clarify the precise role and effect of using TENS. However, TENS machines have proved to be a popular form of pain relief with some people. As with many forms of treatment, the effect can vary from individual to individual, even with the same condition. Electrical – TENS machines deliver small electrical pulses to the body via electrodes placed on the skin. TENS machines are thought to affect the way pain signals are sent to the brain. Stimulation – if pain signals can be blocked by the tiny electrical shocks from the TENS machine then the brain will receive fewer signals from the source of the pain. On a high pulse rate of 90-130 Hz (the normal method of use), the electrical impulses generated by the TENS machine interfere with and block pain messages sent to the brain. This is due to the gate control theory of pain. This proposes that there is a gate mechanism in the brain and spinal cord nerves (the central nervous system). When the gate is open, pain messages get through to the brain and we feel pain. When the gate is closed, these pain messages are blocked and we do not feel pain. TENS machines are thought to stimulate certain non-pain-carrying nerves and close the gate. In effect, the brain is busy dealing with the messages it receives quickly from the TENS machine, rather than the slower (more painful) pain signals that the body is receiving from elsewhere. It explains why, if you injure yourself, rubbing that area can temporarily reduce the pain. How are TENS machines used and by whom? It is best to use a TENS machine only on the advice of a doctor or other health professional. They are not suitable for all types of pain or all conditions. A TENS machine is personally controlled by the user. This means its settings can be adjusted, without having to visit a medical professional. Typically, a machine would be used for 15-20 minutes per session, several times per day. See below for specific instructions. TENS machines are most commonly used for people with musculoskeletal pain, such as long-term (chronic) back pain or knee joint arthritis. They are also often used for pain relief in the early stages of labour, particularly whilst a pregnant woman remains at home. Other less common uses include migraine headaches, period pains, sports injuries and sometimes (quite rarely) non-painful conditions such as tiredness, insomnia or dementia. TENS machines can be used alone for pain relief or be combined with other treatments. The use of a TENS machine might allow reduction of the amount of painkilling medicines you take. Although you might need to try a few settings on your TENS machine before finding the best one for you, there are no real side-effects from using a TENS machine. A TENS machine might be worth a trial, particularly if conventional pain relief methods have been tried and exhausted. Importantly, TENS machines can be expensive. It is probably best if you hire or borrow one first, to try it out. If you plan to try TENS in labour, your midwife or local National Childbirth Trust (NCT) branch should be able to locate one to rent. If you are new to using a TENS machine, take things slowly, even if you are finding it useful. Don’t try to do too much too soon (as you may hurt yourself and make the pain worse). Also don’t stop all your normal painkilling medication too quickly. If you are on either a lot of strong painkillers or a number of different ones, it might be worth consulting your GP for advice. Your GP can help you reduce them safely so you have fewer side-effects.